What you eat and how much you eat matters a lot. Some people have the habit to over eat. If they like something then they feel that as if this is for the last time they are having it and thus they eat as much as they can. But this is harmful for the body. 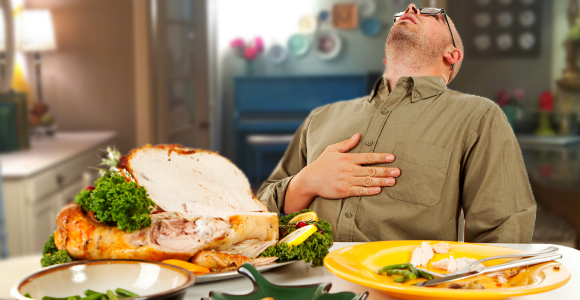 Overeating can create problems in digestion too. Even if you are not dieting you should have some control over the food that you eat. Here are some of the options that will help you to put a curb on your overeating habit. If you go through results from some weight loss studies you will realize that people who eat lot more than their capacity can never lose weight. In fact weight loss is about eating something every two hours. Rather than pushing calories you should try to eat something that has nutrition. But if you try to understand the things given below you will realize how you should go about. Understand hunger first: The very first thing you should do is understand how hunger feels like. You should thus put in some food first and see if you are satisfied. If the body feels you want more try again. Now you have to check whether you are feeling heavy or satisfied. If satisfied then you should immediately stop eating. If you eat after you are satisfied you are actually stuffing the food inside the stomach. Eat breakfast: Some people do not eat breakfast and then they feel very hungry in the middle of the day. This makes them eat junk food or overeat. That’s the reason why you should never skip your breakfast. Even though you are busy you should find some time and have your breakfast. The breakfast should be nutritious and should be filling. Have more of nourishment in meals: You should have more of nourishment in your meals. For this, you should have a balanced diet with lots of fruits, vegetables and whole grains. Try your major meal with salad and soup. This will bring in some level of satiety and nutrition. Now have the chapatti or brown rice or anything that you want. Once you feel you are done, you should stop. Don’t think that next few hours you won’t get food. You should carry a cracker or a fruit with you and when after a couple of hours if you feel hungry you can have that. Have fiber rich foods: Often high fiber foods make you satisfied quickly. As per the results from some weight loss studies if you have more fiber rich foods then you have more chance to remain slim and trim. A well-toned body is loved by everyone and thus you should try your best to stay slim and trim by all means. Along with fiber do not forget addition of protein to food. This is because protein helps in building your overall metabolism. If you follow the above four rules you can surely stop over eating and harming your body.